Internal combustion engine procedure: A basic part of the cycle of an internal combustion engine is the supply of fresh air and removal of exhaust gases. This is the gas exchange process. Scavenging is the removal of exhaust gases by blowing in fresh air. Charging is the filling of the engine cylinder with a supply or charge of fresh air ready for compression. With supercharging a large mass of air is supplied to the cylinder by blowing it in under pressure. Efficient scavenging is essential to ensure a sufficient supply of fresh air for combustion. In the four-stroke cycle engine there is an adequate overlap between the air inlet valve opening and the exhaust valve closing. With two-stroke cycle engines this overlap is limited and some slight mixing of exhaust gases and incoming air does occur. A number of different scavenging methods are in use in slow-speed two-stroke engines. In each the fresh air enters as the inlet port is opened by the downward movement of the piston and continues until the port is closed by the upward moving piston. 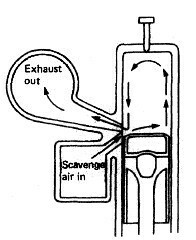 The flow path of the scavenge air is decided by the engine port shape and design and the exhaust arrangements. Three basic systems are in use: the cross flow, the loop and the uniflow. All modern slow-speed diesel engines now use the uniflow scavenging system with a cylinder-head exhaust valve. In cross scavenging the incoming air is directed upwards, pushing the exhaust gases before it. The exhaust gases then travel down and out of the exhaust ports. Figure above illustrates the process. In loop scavenging the incoming air passes over the piston crown then rises towards the cylinder head. The exhaust gases are forced before the air passing down and out of exhaust ports located just above the inlet ports. The process is shown in Figure below. With uniflow scavenging the incoming air enters at the lower end of the cylinder and leaves at the top. The outlet at the top of the cylinder may be ports or a large valve. The process is shown here. Each of the systems has various advantages and disadvantages. 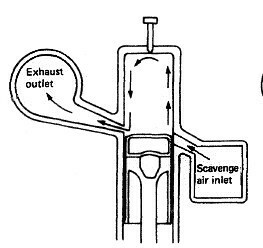 Cross scavenging requires the fitting of a piston skirt to prevent air or exhaust gas escape when the piston is at the top of the stroke. Loop scavenge arrangements have low temperature air and high temperature exhaust gas passing through adjacent ports, causing temperature differential problems for the liner material. Uniflow is the most efficient scavenging system but requires either an opposed piston arrangement or an exhaust valve in the cylinder head. All three systems have the ports angled to swirl the incoming air and direct it in the appropriate path. Once a fire is detected the engine should be slowed down, fuel shut off from the affected cylinders and cylinder lubrication increased. All the scavenge drains should be closed.